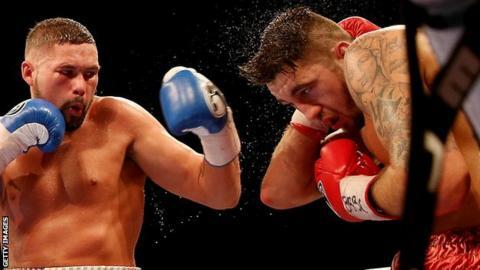 Welsh boxer Nathan Cleverly says he may step back down a division to light-heavyweight following Saturday's defeat by Tony Bellew at cruiserweight. The 27-year-old lost a split decision 114-115 116-112 115-113 in Liverpool. Cleverly beat Bellew on points in their previous encounter at light-heavyweight to retain his WBO world title in 2011. "It's hard at this weight. Bellew's a heavyweight as an amateur coming down so he's naturally the bigger guy," Cleverly told BBC Radio Wales Sport. "I'm trying to pump into the cruiserweight division, but it comes at a cost. "The cost is I'm giving away a lot of my assets, which is my stamina. The speed is OK but it does tend to slow you down generally." Cleverly enjoyed success in the early rounds with his jab, but struggled after the midway point as Bellew stepped up the pace - with the Welshman spending the majority of the last three rounds on the ropes. An injury to his right hand, which Cleverly has said happened in the third round, also hindered the Cefn Fforest fighter but he admits fighting at the 14 stones, four pounds (90.892 kilograms) limit was also an issue. "It worked early on when I was fresh but then trying to work at that output, carry that speed through the 12 rounds at cruiserweight, you pay the price in the later rounds," Cleverly said. "It's the first time I've done 12 rounds at cruiserweight. I've only been two rounds and four rounds in my previous fights so I'd never experienced the later rounds." Bellew pointed out that Cleverly was "not a cruiserweight", a fact that the Welshman agreed with. "If we're being realistic I'm not," he said. "In an ideal world we'd have a weight between light-heavy (which goes up to 12½ stones, or 79.378 kg) and cruiserweight, maybe somewhere around the 13½ stones mark, but there's not." Cleverly has not ruled out a rematch with Bellew, with the series between them now standing at a win apiece. But it seems the Welshman will now give serious consideration to returning to light-heavyweight where he won his world title and was undefeated until losing his WBO belt to Russia's Sergey Kovalev in August 2013. Kovalev has since added the the IBF and WBA belts by beating Bernard Hopkins. "I've got to sort out, get a clear mind, make sure what weight I'm going to fight at - if it's going to be light-heavy do it properly - and give it a blast again," Cleverly added.